If you hold an FAA pilot certificate, FAA regulations require that you pass a biennial flight review (or equivalent check) every 24 calendar months. Additionally, if you hold an FAA Instrument Rating and your instrument currency fully lapses, you must regain this with an instructor before you can legally fly under IFR*. We're pleased to provide these and other FAA flight instructor services for pilots based in Europe, the Middle East, or Asia. Our instructors each have over ten years and thousands of hours flight instruction experience and each holds current FAA single-engine, multi-engine, and instrument (CFI-I) airplane instructor ratings. Additionally, most hold FAA advanced ground instructor and sundry other licenses and certificates. We are not "time builder" instructors -- we genuinely enjoy flying and teaching and sharing our passion for flying with you. A typical student who might seek our services is a busy aircraft owner in Europe or elsewhere flying under an FAA certificate. Services may generally be provided in both N-registered and non N-registered aircraft. It is our goal to provide personalized instruction to the highest standard. For example during BFRs, the goal is to use our time efficiently to make you a better pilot and perhaps identify weak or vulnerable areas and opportunities in your flying habits, not to waste your time on ritual or triviality. (Legal notices ahead:) All of the services we provide will be, to the best of our ability, in strict compliance with FAA and other applicable rules and regulations. This means, for example, that while BFRs, IPCs, and similar things can generally be accomplished by existing FAA certificate-holders with a minimum of fuss, training for new ratings, while possible, can be accomplished only if the applicable FAA/TSA regulations are complied with. 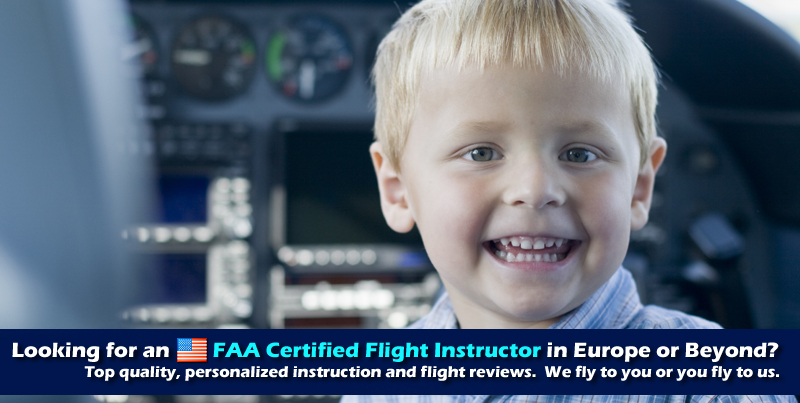 If you are interested in training towards a new rating, please help us help you by doing as much research as you can into the requirements for this given your particular situation beforehand as FAA regulations in this regard change often. We have had excellent success in providing concentrated yet highly effective instruction for all manner of certificates and ratings. You need not necessarily be a US citizen to take advantage of many of the plusses of FAA certification, though in general this web page is for those who already hold some form of FAA certificate. We are willing to travel throughout Europe, the Middle East, and Asia, and Africa as needed. If there are several FAA-certificate holding pilots at your location, you may find it convenient to consolidate costs by having one of our instructors fly out to meet with several of you at once. It is also possible to fly in your aircraft to us. We are often in southern or eastern England, but are also available at times at "home bases" in France and Eastern Europe. When in the UK, we are often near Stansted or Luton, making it relatively inexpensive for us to airline out to you on a discount carrier. Singles, Twins, Props and Jets OK! Glass cockpit or steam gauges ok! Helicopters also possible though may require instructor travel from the USA. Endorsements such as tailwheel, high altitude, high performance, complex, spin, etc. possible. You must have access to an aircraft. We do not provide aircraft for such services. We are not a flight school. Should we fly together, you will naturally be responsible for any and all regulatory and airspace issues in your area. Applies to all but ab initio pilots; we don't anticipate many ab initio pilots. Discretion and professionalism. We are humbly grateful for the opportunity to fly with any and all pilots. We also understand and have specific experience with the requirements of high profile or special profile individuals. Safety is always paramount of course. However, beyond that, our philosophy can be summed up as "Intelligent learning while never forgetting that flying is supposed to be fun." Important! We are not a career consulting / license transition advice / Q&A service. Unfortunately, a very high number of enquiries beyond our ability to reasonably handle has made it necessary to place this message. If you have questions about converting your European certificate to FAA or vice versa, please contact the FAA International Field Office (IFO) in Jamaica, NY or the equivalent agency in your target country. We can also generally not reliably answer questions of the form "where can I find FAA X in Y" nor are we comfortable in giving quasi-legalistic / FAA regulation advice to all comers. We apologize in advance for this. We wish we had all the time in the world to answer every such question that people have of us, but some weeks we found ourselves answering dozens of such questions, quite a few by surprisingly unappreciative pilots who gave no thought to the hours of our time their questions demanded, and so we've had to cut this off for all but those legitimately interested in our bespoke services as it just got overwhelming. You'll get the best, most official answers to many questions by contacting the FAA IFO in New York - it's the job of those the good people there to answer your questions. Interested? The first thing that you should do is to write us a note (subject: "FAA CFI service request") via the Dauntless helpdesk briefly describing your circumstances. Please include a phone number where you can be reached. Your message will be forwarded to the appropriate person(s) and you will be contacted as soon as possible. * We've obviously abbreviated the regulations here a bit. Please consult FAR 61.56 for more information about the FAA Biennial Flight Review or 61.57 for information about Instrument Proficiency. ** The instructors providing this service are generally associated in one way or another with Dauntless Aviation, but any such services given are NOT services of Dauntless Avaition. Dauntless Aviation provides space for this notice and related technical facilities here as a courtesy only.